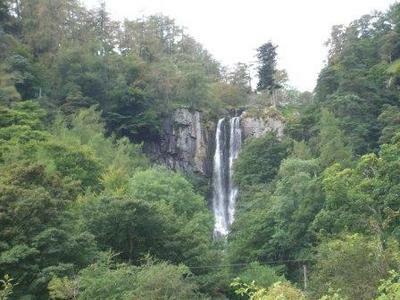 At 240ft Pistyll Rhaeadr is one of the taller Welsh waterfalls. 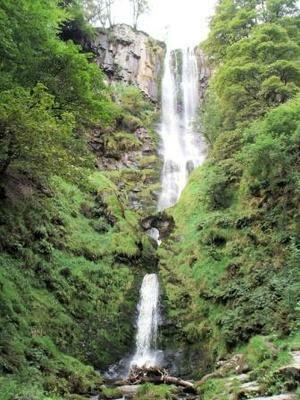 It is situated in the Berwyn Mountains of mid Wales not many miles in from the English border. To access the falls from the village of Llanrhaeadr-ym-Mochnant follow the sign for the fall up a single track lane for about 4 miles. There is some free parking on the side of the road or you can pay to park in the car park of the café right by the fall. This graceful fall plunges over the cliff under a natural rock bridge and then falls again. It is easily viewed from a metal bridge that crosses the river at its base. For those feeling more energetic a 20minute scramble up through the woods will bring you to the top.